This week we have only two films getting major releases, one of which i am looking forward to checking out and the other that i couldn’t care less about. The two films releasing this week are Owen Wilson’s latest film ‘No Escape’ and Zac Efron’s new film ‘We are Your Friends’. Lets get into these films starting with No Escape. 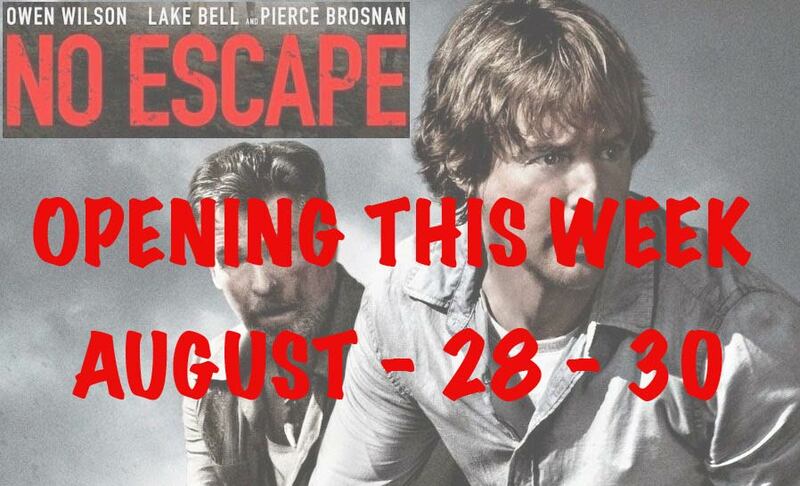 ‘No Escape’ is an action thriller starring Owen Wilson, Lake Bell, and Pierce Brosnan. The film follows a family that after moving to Asia get caught up in city-wide warfare and fight to survive. I am looking forward to seeing this movie because although the trailer didn’t make the film look amazing it looks like an interesting action film with a plot that could turn out to be very good in the film. Plus, i want to see Owen Wilson in a more serious role that is a little different from his previous roles and see how he does or does not pull it off. The least i expect of this film is that its fun, if they can provide me with a fun ride with characters i can care about than i will call this film a success. I haven’t seen a whole lot of marketing for this film so i’m not sure it will leave much of a mark on the box office. Heres the trailer to see for yourself. Next up we have ‘We are Your Friends’, a music/drama film starring everyone’s favourite High School Musical star Zac Efron…… Personally i don’t care about this film like at all, the trailer didn’t do a good job at selling this film at all. The film follows an EDM DJ who has a dream he wants to chase of becoming a world-wide music producer, sounds fun right? wrong… This sounds like a generic rise to the top story with music and Zac Efron injected into the film. I don’t really know who this film is targeting and the trailer doesn’t really answer that question, and with no obvious target audience this film is most likely going to bomb hard at the box office. Here is the trailer to give you a reason why not to see this movie. So there you have the two films releasing this week that i don’t think have had strong enough marketing campaigns to make a huge impact on the box office. What will you be seeing this week? One of these new releases or one of the many other (probably better) films already out right now? Next Movie Review: SOUTHPAW – Jake Gyllenhaal KILLS IT!!! !